Aesop Rock recently dropped his seventh studio album, The Impossible Kid, and the hyper-clever indie rhyme-slinger is taking his acclaimed new record on the road. 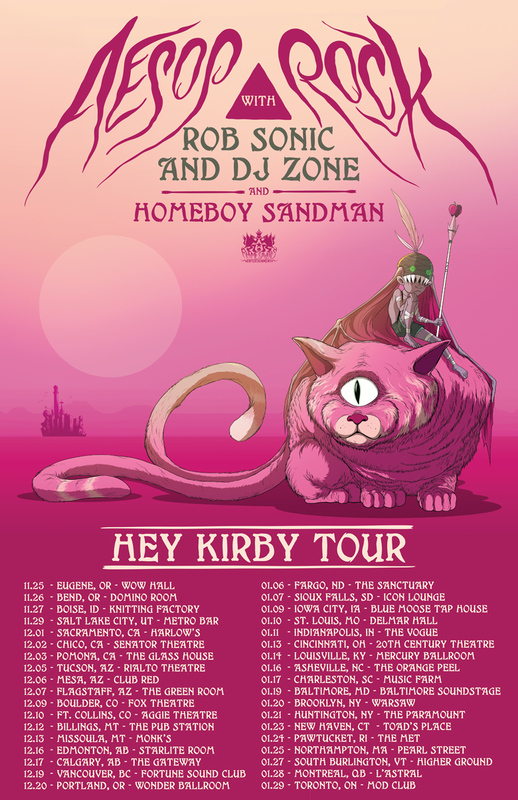 Today, Aesop has announced the Hey Kirby Tour, which will find him accompanied by comrades Rob Sonic and DJ Zone for an extensive run of North American shows. The headlining tour will include support from Queens MC Homeboy Sandman, with whom Aesop recently released Lice 2: Still Buggin’, a free five-track EP that you can stream right here. In conjunction with the tour, Aesop has also shared a clever, videogame-inspired video for “Shrunk,” directed, edited and animated by Rob Shaw. Aesop and Shaw previously collaborated on an album-length, animated recreation of The Shining that accompanied a complete stream of The Impossible Kid. The “Shrunk” video “re-contextualizes the song’s narrative about Aesop’s adversarial relationship with therapy as an arcade videogame (one exceedingly hungry for coins),” per a press release. Aesop also recently released a must-see video for “Kirby,” in which the rapper appeared in puppet form to pal around with a rescue cat. The track itself is an ode to Aesop’s beloved cat Kirby, after whom he has now named his new tour. You’ll find that video here. Watch the “Shrunk” video above and find Aesop Rock’s newly announced tour dates below.